without rancid,bitter or other peculiar odor. 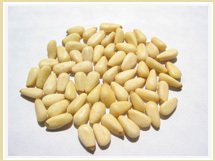 Color: White-yellowish – typical of pinenuts. Texture: Firm, smooth, no brittle, soft or oily. of the whole kernel ): 1% Max.